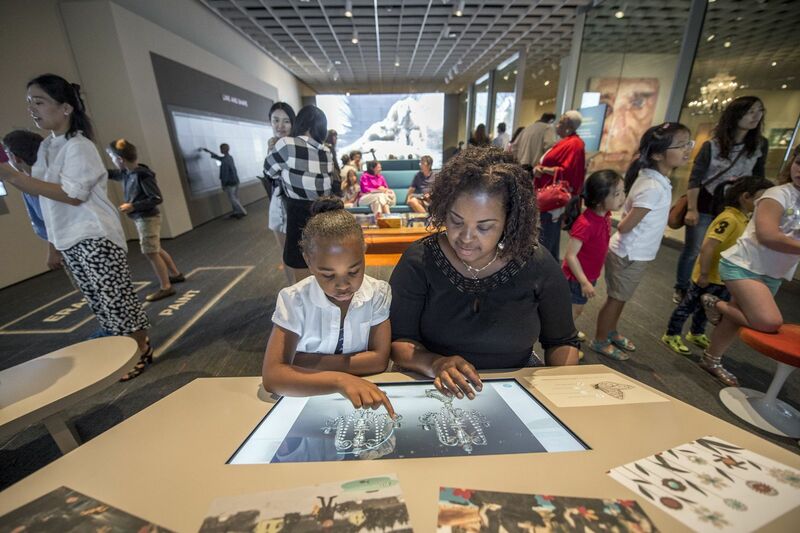 On June 16, 2016 the Cleveland Museum of Art opened the doors to the ArtLens Studio, a completely re-imagined expansion of the museum’s original Studio Play. Studio Play, which opened in December 2012, was a space for young kids and families to de-stress and engage with high-touch, screen-free activities. While this popular space served an important purpose, the museum found that it had devolved into an unsustainable playroom, instead of an area for visitors of all ages to create art and become familiar with the museum’s collection. Rather than change for change’s sake, ArtLens Studio was designed with the entire family in mind and uses innovative technology, movement, and play to introduce new ways of looking at and creating art. Astonishing in its visionary breadth, the magic of ArtLens Studio is deceptive in its simplicity. 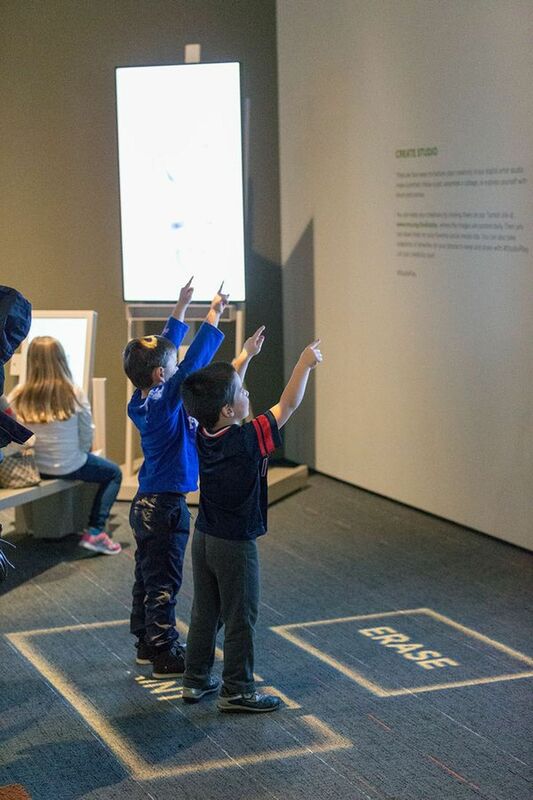 While visitors are having fun, they are also looking closer, making connections and gaining comprehension that will enhance their appreciation of art throughout the museum. ArtLens Studio is the first step in re-launching the entire Gallery One as the ArtLens Gallery: encompassing the ArtLens Studio, re-engineered ArtLens App, ArtLens Exhibition (formerly Gallery One proper), and the ArtLens Wall (formerly the Collection Wall). 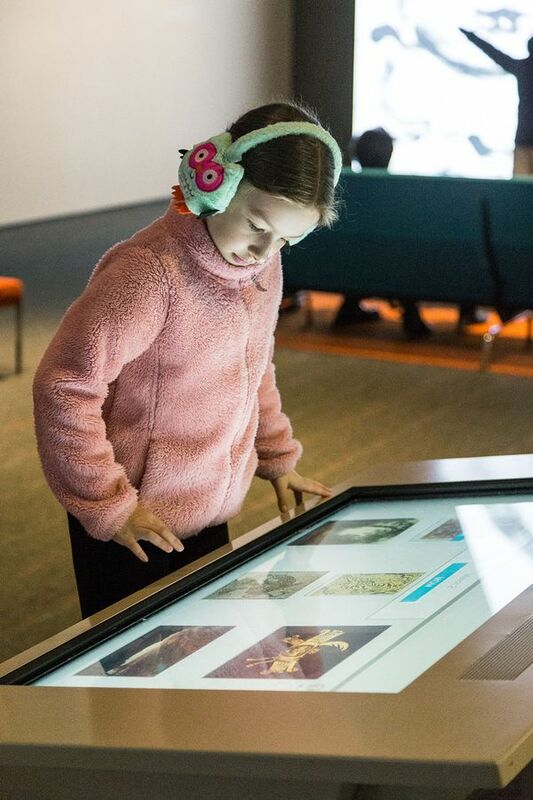 The ArtLens Studio is part studio for visitors to create digital works of art, and part deep-dive activities that encourage looking closer at objects in the museum’s collection. At the Reveal and Zoom Wall, visitors use their bodies to reveal artworks or zoom into an artwork in great detail. In the Create Studio, visitors create their own unique artworks at the four stations: Pottery Wheel, Collage Maker, Portrait Maker and Paint Play. 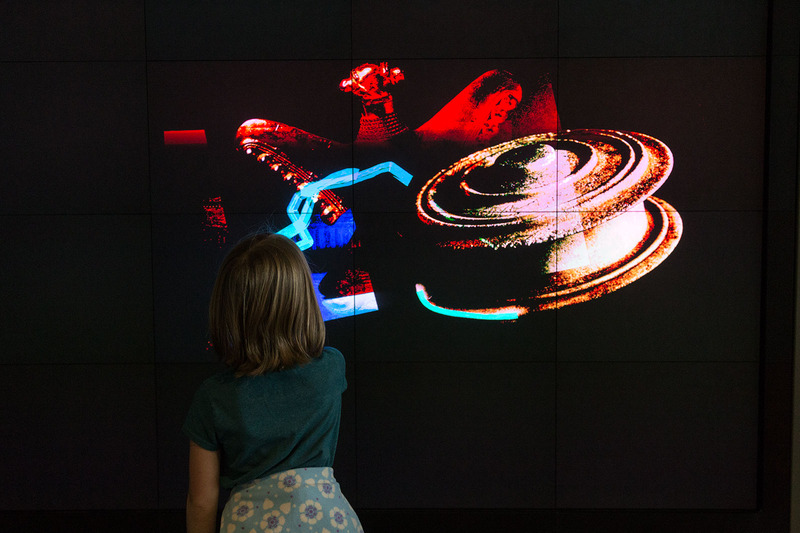 These installations use a combination of time-of-flight depth cameras, custom C++ software and real-time graphics to create interactive experiences that allow visitors to play with traditional artistic techniques, in a playful, gesture-based way. All stations are designed to be accessible for visitors of any age and size, as well as those with limited mobility. No stations in ArtLens Studio depend on audio content, creating a universal experience for visitors who are hearing-impaired. 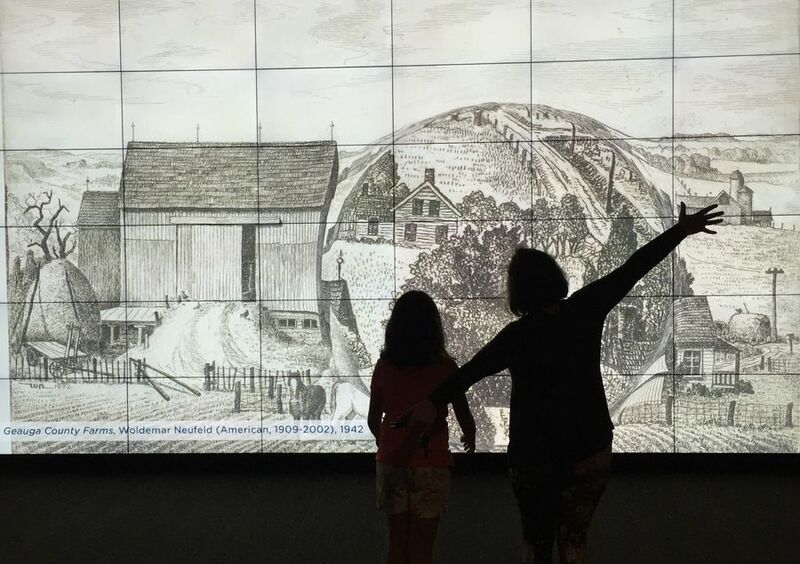 The Reveal and Zoom Wall allows visitors to view and zoom in on artwork on a larger-than-life scale, enriching the experience for sight-impaired visitors. Visitors at the Cleveland Museum of Art use body motion to reveal the blurred-out image of a masterwork from the museum’s collection. The Create Studio is a place for visitors to unleash their inner artist. The interactives in the Create Studio build on the museum’s 100 years of experience in studio-based programming, including the well-loved offerings of Museum Art Classes and Second Sundays. Create Studio offers four different ways to make artwork in a space resembling an artist’s studio. Visitors save creations by sharing them on the museum’s Tumblr site. 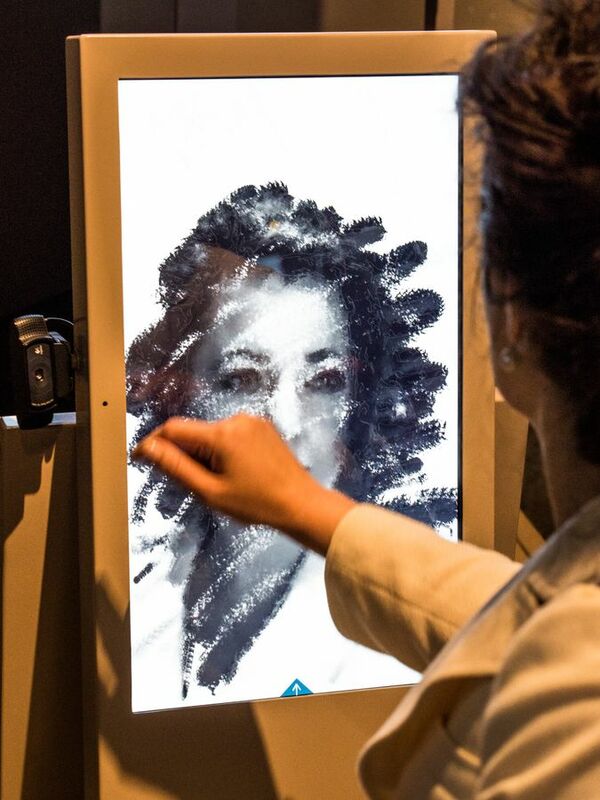 Portrait Maker: This interactive allows visitors to craft their likeness in the style of the portraits that line the walls of the museum, using a photograph of themselves. Choose from oil, charcoal or watercolor to create a self-portrait that is realistic or abstract. A visitor at the Cleveland Museum of Art creates a self-portrait based off of the materials of portraits in the museum’s collection. Pottery Wheel: A spinning block of clay is molded into shape as visitors mimic a potter’s movements at a wheel. Using depth-tracking cameras, this interactive magically recreates the experience of a potter at the wheel. For example, the intensity of the participants’ gestures changes the width of their vessels. 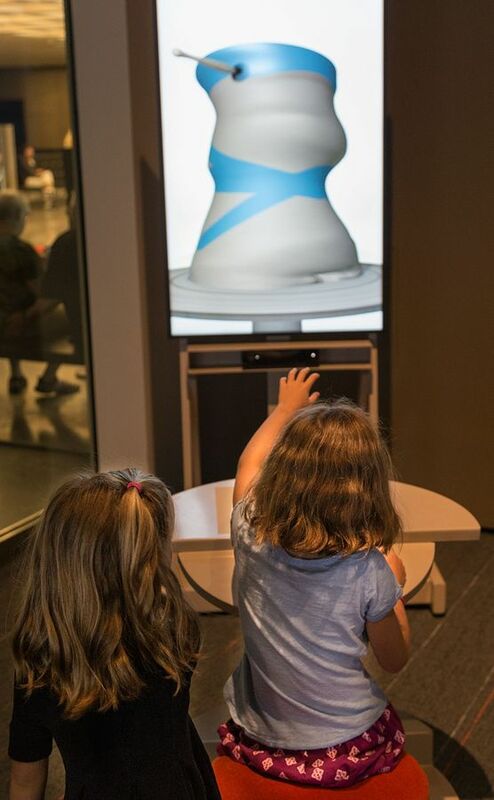 Young visitors at the Cleveland Museum of Art work together to create a piece of potter using screen-free, motion-detecting technology. Collage Maker: With a snip and a clip, visitors are able to create collages using a wide variety of images from the museum collection. Pair, enlarge, rotate and duplicate details from a favorite modern painting with scenery from masterworks by medieval artists to create something new and unique. Visitors at the Cleveland Museum of Art snip and clip images from the museum’s collection to create digital collages. 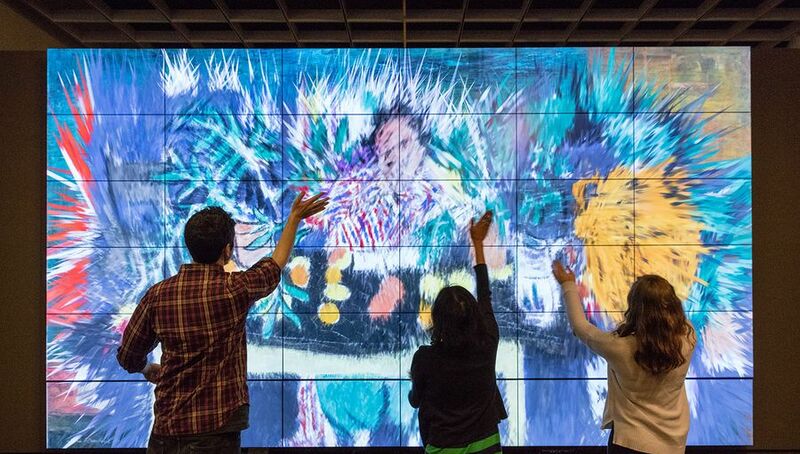 Young visitors at the Cleveland Museum of Art work together to fling paint onto a digital canvas. By stepping forward into the “erase” gobo, visitors can easily restart their painting. The Reveal and Zoom Wall engages visitors in two different methods of investigating the collection. Reveal encourages visitors to consider composition first before details come into focus, while Zoom invites visitors to explore details closely. 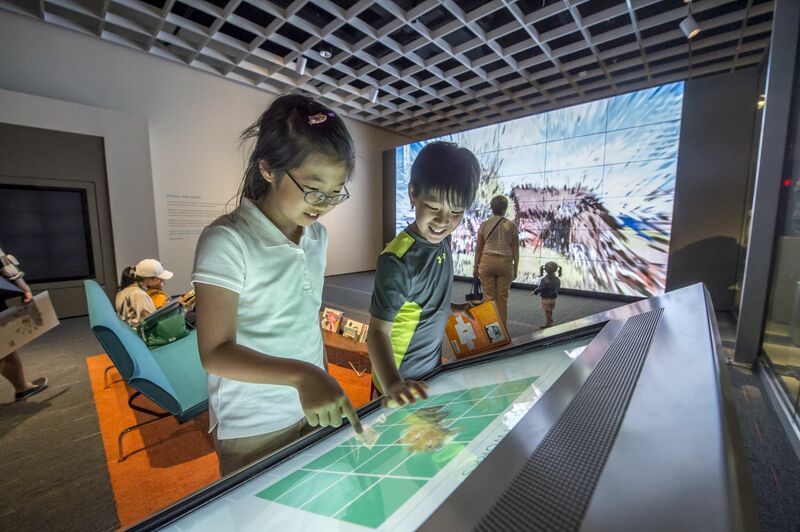 Reveal and Zoom alternate on a 4K interactive video wall that uses the body as a tool to explore masterworks from the museum’s collection using innovative motion-tracking technology. In Reveal, a larger-than-life-size image is at first blurry, but visitors’ movements, individually or in groups, bring the artwork into sharp focus. Sweeping gestures bring about subtle changes to the image, while smaller, focused movement extracts finer details. The process continues until the object is entirely “revealed.” With Zoom, the visitor’s body acts as a pinch-and-zoom magnifying glass. Using body movement, participants can examine every detail of a work of art, encouraging visitor-led investigation. Visitors at the Cleveland Museum of Art use their bodies zoom in on a larger-than-life image of an artwork form the museum’s collection. This game, a favorite of visitors to the original Studio Play, has been enhanced and enlarged in this new iteration of the ArtLens Studio. Visitors draw lines and shapes on a large touch screen, and these simple forms are rapidly matched to one of over 7,000 works in the museum’s collection. Line and Shape encourages discovery, focusing on details of different works in the CMA’s extensive holdings. A young visitor at the Cleveland Museum of Art draws a shape on the Line and Shape Wall, which is matched to a detail in a work of art from the museum’s collection. A young visitor at the Cleveland Museum of Art matches artworks based on themes and objects in the different artworks. Young visitors at the Cleveland Museum of Art “flip” cards to match details of objects from the museum’s collection. ArtLens Studio provides a unique introduction to the museum’s collection while building appreciation and the foundations of visual literacy for the next generation of art connoisseurs. Visitors are exposed to a range of artwork in the museum’s collection through creative and active prompts. The space, filled with whimsy and fun, enhances the visitors’ experience of the entire museum.